Paul Gauguin Cruises, operator of the Tahiti-based Paul Gauguin ship, has acquired a second ship that will begin sailing under the Paul Gauguin Cruises banner in December 2012. This ship will undergo a renovation in November 2012 and then will be christened Moana. 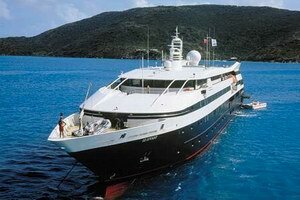 The vessel will have 45 staterooms for a total capacity of 90 guests. The company did not reveal further details about the ship, but other sources say it is the former Ponant vessel, the 1991-built Le Levant. Paul Gauguin Cruises is owned by Pacific Beachcomber, French Polynesia's largest luxury hotel operator. "We are monumentally proud to add a second ship to our Pacific Beachcomber portfolio and Paul Gauguin Cruises family," Paul Gauguin Cruises president Diane Moore says in a statement. "This is an incredibly huge branding achievement for the growth of our cruise line and I look forward to welcoming fans of The Gauguin on board our latest addition."